(Amr Abdallah Dalsh/Reuters) In unprecedented protests inspired by the revolt that brought down Tunisia's president, thousands of Egyptians clashed with police and demanded an end to President Hosni Mubarak's 30-year rule. For decades, American policy in the Arab world has rested on the assumption that secular governments are better. In a region prone to religious violence and sorely lacking in democratic government, the thinking goes, it is secular regimes that hold the most promise for change, and have been the easiest for us to support. Though perhaps never stated in such simple terms, this thinking underlies much of our diplomacy and analysis of a volatile and strategically important region. It’s easy to see why: A secular government is more like a modern Western democracy, and a better fit with our own tradition of separating church and state. We tend to believe that even if secular Arab regimes are oppressive, they represent at least a small step toward a more modern, stable, and democratic future for the region. Washington has funneled its greatest Arab aid to secular strongmen like Hosni Mubarak of Egypt, who openly trumpet the need to squelch Islamic political movements. It has dealt more warily with Islamic monarchies like Saudi Arabia. But can today’s secular governments really be the basis for a stable Middle East? The recent overthrow of the president of Tunisia suggests an uncomfortable answer. The Tunisian revolution was the biggest political news in the Arab world in years, triggering wide speculation on its deeper causes and how much it will spread to other countries. But one thing is undeniable: In a region full of monarchies and other unelected regimes, the government that fell — the one government unable to maintain enough hold on the public to weather a crisis — was the most secular one. For over four decades, Tunisia’s political leadership looked, if not like a model regime, then at least like a step in the right direction. Habib Bourguiba, its first independent leader, banished religion from a role in the state and actively promoted women’s rights and education. Since ousting Bourguiba in 1987, ex-president Zine El Abidine Ben Ali attracted Western ties and tourists, consistently fighting Islamism and raising fears about its influence. Despite an impressive general record of economic achievement, Ben Ali has just become the first modern Arab leader to be ousted through popular mobilization. 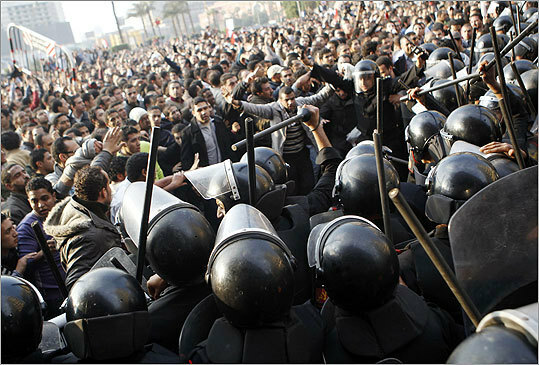 In Egypt, the most populous Arab country, another secular regime struggles to fend off the seething anger of its people. And in secular Algeria and Yemen, copycat protests may be setting the stage for similar widespread demonstrations. This rising tide of mass protests against Arab secular strongmen urges us to think again about the role of Islam and government. Decades of Western policy have pushed Middle Eastern governments toward secular reforms. But a more nuanced view of the region — one that values authenticity as much as Western dogma — suggests something different. If we are concerned about stability, balance, even openness, it may be Arab Islamic governments that offer a better route to those goals. To most Western thinkers, suggesting a role for religion in government seems to be sailing against the wind of history. Europe’s rise to industrial greatness, democracy, and global power came in the wake of deliberate secularization. Part of the enduring appeal of the American dream is its religious tolerance. Russia, China, and the rest of East Asia have all flourished economically, if undemocratically, under secular rule. Yet the examples in the Arab world look very different. The Middle East and North Africa is the world region most lacking in democratic government, tempting policy makers to imagine that positive change, as it has elsewhere, will go hand-in-hand with secularization. But the Middle East is also the origin and heartland of Islam, a faith sustained in part through its ability to serve as a political order as well as a religious belief. Unlike Americans, who may be deeply religious but are also raised to believe in separate realms of church and state, many quite moderate Muslims see nothing strange in the notion of a government fully infused with religious purpose. Survey research in the Arab world, such as the University of Michigan’s Arab Barometer project, has found that respondents generally consider themselves Muslims above other markers of identity, including national citizenship. As a result, Islam isn’t just a feature of a national government; for many citizens, it may be as important as the idea of the nation itself. By forcing Islam out of state politics, as Tunisia did, the government can actually reduce its own legitimacy in the eyes of the people, leaving it vulnerable and forcing it to lean more heavily on the machinery of a police state. One implication unsettling for many Westerners is that democracy in the Middle East might look very different from democracy in the West. In a global poll known as the World Values Survey, the vast majority of citizens of countries as diverse as Algeria, Egypt, and Jordan argue that state politics should be based on Islam’s system of jurisprudence known as the sharia. Similarly strong support exists for the proposition that Arab officials should be good Muslims. Secular regimes in Tunisia and Egypt have stayed in place through military force and fear. If citizens were allowed to choose, as they almost could before the army intervened in Algeria in 1992, they might vote for something that looks very different than our idea of a modern pluralistic government. But it might be insulated from the kind of instability and uncertainty we have seen recently. When Tunisians took to the streets this month, part of what motivated them was moral outrage about the corruption of their secular president’s family and cronies. Good Muslim leaders might not ignore their religion’s calls for social justice by so gross a level of stealing public funds. The uncomfortable fact for Western policy makers is that Arab traditional monarchies have fared much better in recent decades than secular republics: With at least a toehold in Islamic political tradition, monarchies have been able to weather crises and enjoy stable transitions between leaders. And although it’s common to lump all Arab governments together, whether conservative Muslim states like Saudi Arabia or police states like Syria, in fact the stability and popular legitimacy of an Islamic monarchy can allow for something surprising: modern openness. For example, Morocco holds yearly allegiance ceremonies confirming the king with titular status as head of the national religious community, dramatizing his legitimacy as a traditional leader. But over the years, Morocco has also accommodated religious opposition and debate. The country is one of the last Arab bastions of an autonomous, open Jewish community. Since independence in 1956, it has had the most and freest political parties in the Arab world. And Morocco’s Arab monarchical peers to the East, countries like Oman and the United Arab Emirates, have become centers of global culture, education, media, and tourism in recent years. The small kingdom of Qatar will be the first Middle Eastern state to host the World Cup, in 2022. Arab kings can act as a calming buffer between popular citizen demands and state institutions. Their relative legitimacy has allowed them to trim their repressive security apparatus, in comparison with states like Tunisia. Generally, monarchies rank highest among Arab states on global measures of good governance such as Freedom House’s index of freedom and the World Bank’s rule of law indicator. Morocco is the only Middle Eastern state to establish a national commission to acknowledge and redress previous human rights violations. By contrast, the mass killings of secular rulers like Saddam Hussein in Iraq and Hafez el-Asad in Syria have nothing like a parallel in post-colonial Arab royal history. If we think of “modern” governments as those that can accommodate change, freedom, and pluralism, then Islamic monarchies have satisfied this definition much more than secular republics in recent years. Certainly the thousands of protesters in Tunisia in the last month, and in Egypt at the moment, haven’t seemed impressed with the achievements of their secularist leaders. In fact, Arab monarchies that simulate aspects of the political Islamic past are not only comparatively stable, but better bets for controlled transitions to free governments. Recent global experience suggests that, despite the much-publicized intolerance of extremists, Islamic political ideas are compatible with democracy. Arab Islam’s long history provides many concepts that resemble, without duplicating, Western democratic practices, such as town meeting (“majlis”) and representative consultation (“shura”). Indeed, today’s Arab kings have adapted such ideas to negotiate and build consensus around important policies. And there is ample evidence that Islamist political opposition parties compete fairly in Arab elections, when they are allowed to do so. Washington’s understandable concern about particularly aggressive manifestations of Islam such as al-Qaeda and the Taliban — and the anti-Americanism of Iran’s Islamic revolution — has pushed us to hold almost monolithic views about the general nature of Muslim politics. But the bleak record of secular Middle Eastern states suggests that a sounder policy would be one more open to Islamic models of rule like Morocco and Qatar — nations sufficiently inoculated against direct attacks in the name of Islam that they can create public space for liberal education and open media. Such public space has already borne fruit in the form of increasing religious, secular, and mixed alternatives to express political views. Secular plural democracy developed in the West through a gradual process of disentangling the rigid links between state institutions and religion. Yet religious belief endured. Islamist monarchies have birthed cosmopolitan societies, such as in Dubai, and influential independent media empires, like Al-Jazeera in Qatar. When they are flexible, these monarchies may well be the midwives of a comparable, steady process of democratization that is appropriate to contemporary Arab Islam. By thinking more broadly about the progressive potential for Islamic politics in the Middle East, the West may reap another benefit. Viewed from the region, American intervention doesn’t look nearly as benevolent as Americans may imagine, and this has magnified a widespread view that Western powers fail to practice the ideals of freedom that they preach. Today, many Arabs believe that Western exhortations of religious tolerance and democracy are a cover for attempts at political control. A sounder US policy towards Middle Eastern governance would be one that considers what the people there truly want, not on our terms, but on theirs — whether secular or not. David Mednicoff is a professor in public policy and social and political thought at the University of Massachusetts Amherst, a research fellow at the Dubai Initiative at the Kennedy School at Harvard, and a former Fulbright Scholar to Morocco and Qatar.